Dani Pedrosa has written on his Repsol Honda Team blog for the first time since missing the German Grand Prix, acknowledging the support of his fans and suggesting the championship could still deliver several more twists before the end of the season. After suffering a minor fracture to his left collarbone in a Saturday morning crash at the Sachsenring, Pedrosa was forced to sit out of the race due to feeling dizzy on Sunday morning. He travelled back home to Barcelona in order to rest before heading towards California for this weekend’s race at the Mazda Raceway Laguna Seca. "I want to thank you for the many messages of support I have received," Pedrosa writes in his latest blog, having been ruled out of the race not because of his collarbone injury, but because of low blood pressure. "The important thing is that I feel good. I will have to see how things go with regards to the collarbone, but as for the rest of the problems the really important thing is that I am feeling well. "It was a real blow because we arrived at the Sachsenring in a good position in terms of the World Championship, but that’s racing and you have to keep looking forward. The championship is long and we are still only roughly halfway through it, so a lot can still happen yet." 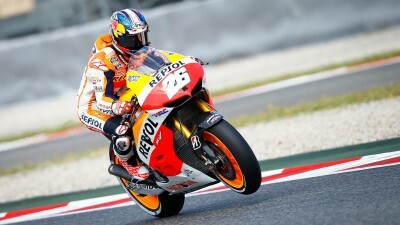 Like Yamaha Factory Racing’s Jorge Lorenzo, Pedrosa – who had won the previous three German Grands Prix – watched the race from afar. Both absentees were overhauled in the Riders’ Championship by Pedrosa’s winning teammate Marc Marquez, who carries a two-point lead into this weekend’s Red Bull U.S. Grand Prix.